Saturday, October 22, 2011 was a big day. We unveiled Power Suits: An Art Quilt Challenge at Artistic Artifacts in Alexandria, Virginia, to a bustling space filled with artists, family members, friends, and newcomers to the art quilt world. When Judy Gula and I issued this art quilt challenge in April, we could not have predicted the number, variety, or quality of quilts that were sent to us. Every day was Christmas as we opened boxes and registered the 18″ x 18″ treasures! 105 artists responded with 108 quilts, addressing topics as varied and unexpected as playing cards, super heroes, swim suits, ancestors, robots, politics, and animals. And there were, of course, quilts that focused on men’s suits and women’s equivalents to the power suit wardrobe. As our guests moved from quilt to quilt, reading artist’s statements and reacting the artwork, I repeatedly heard comments like, “How did they do that?” and “I would never have thought of that!” Surprisingly, while some topics were addressed by multiple artists, each quilt was unique. Quilts will remain on exhibit at Artistic Artifacts in Alexandria, Virginia, through November 23, 2011. They are available for viewing during shop hours or by special appointment. Judy and I agreed to put out ballots for Viewers’ Choice Awards, not to judge the quality of the quilts but to celebrate the reactions the quilts evoked. Thanks to my hubby for that idea. We found that people (read: people who are not quilters but came anyway) seemed more engaged in really looking at the quilts. I loved watching the discussions! The Viewer’s Choice Made Me Laugh Award went to Marilyn Owendoff for her quilt Power in Any Suit. I watched as people led their friends over to see Marilyn’s quilt. 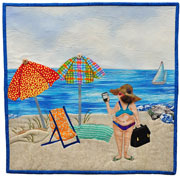 It certainly had lots of people smiling as the bikini-clad body on the quilt clutched her smart phone while enjoying the rays on the beach. 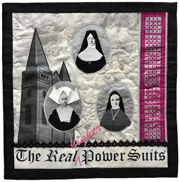 The Viewers’ Choice Made Me Think Award went to Ellie Flaherty for her quilt The Real Power Suits. The quilt featured three nuns made in the image of her mother, her grandmother, and her great-grandmother. I love the play on words: The Real Higher Power Suit. The Viewers’ Choice Hands-Down Favorite Award went to, well, me! I created a quilt called Power Suited Him from a portrait of my father. This image of my father has been a favorite of mine and I loved using it for our Power Suit Challenge logo. I tried to develop a different idea for my challenge quilt, but I kept coming back to my father’s picture. I’ll try to blog a little about process later. In response to requests for a class in this technique, I will offer a Studio Tech class in photo-inspired art quilts at Artistic Artifacts in the coming year. I’m thrilled to say that our quilts are scheduled to travel! We currently have two quilt shows on our calendar and we are looking for more opportunities to share these treasures with more quilters. If you are interested in showing our quilts, please contact me. We’d love to hear from you! 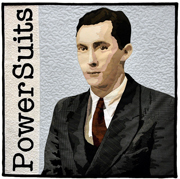 We’ve created a Power Suit Quilts CD that includes the quilt images and artist’s statements. We’ve included two formats on the CD: a PowerPoint presentation that requires PowerPoint on your machine to view and a PDF that requires Adobe Acrobat Reader (a free download that comes loaded on most machines) to view. These will be available at Artistic Artifacts in Alexandria, Virginia, at the Artistic Artifacts booth at the IQA Festival in Houston, TX November 3-6, 2011, and on the Artistic Artifacts website after the second week in November. While we had a captive audience, Judy and I announced our next challenge: Arts & Old Lace! Unlike the Power Suit Challenge, we’ve limited the number of packets we’re distributing. After the feeding frenzy at the debut, we continued to receive calls for the packets. We’re taking whatever we have left to the IQA Festival in Houston, where I believe they will disappear in a flash. More about the next challenge in a future blog. For now, thanks for following our Power Suits Art Quilt Challenge. We’ve had an unbelievable amount of fun and we hope you have, too!